THE MARTINI CHRONICLES: Dr. Oz's Green Drink! Greetings Divas and Gents! 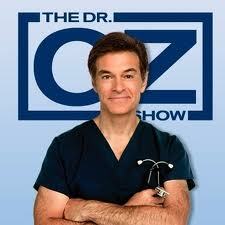 As some of you may know, I have recently become a huge fan of Dr. Oz. There's something so comforting about him, and I love the fact that he is always sharing ways to better one's health. I recently found myself stalking browsing Dr. Oz's website, and I came across the recipe for his Green Drink. Some months ago, I started making fresh fruit and vegetable smoothies to enjoy on my way to work. After doing so for a while, I found myself feeling more energized at the beginning of the day, and less hungry. So when I came across the Green Drink, I was all in! Just a quick disclaimer: I have not yet tried the Green Drink, so I'm not sure how it tastes. I intend to try it this weekend, and tweak it to my liking. If any of you have tried the Green Drink, let us know how you like it. Also, let me know if you intend to try it...maybe we can exchange notes! Use adjectives like gnawed, unhygienic, bad that would make a difference to you. Your family members and friends should always remind you whenever they see your fingers in your mouth. really would want to…HaHa). You definitely put a fresh spin on a topic that has been discussed for decades. Keep up the great work! You know, many people are looking round for this information, you can aid them greatly. Simply want to say your article is as surprising. The clearness to your publish is just great and that i can assume you are an expert on this subject. is proper specially cardinal when it comes to these small moves so you are nerve-wracking to ameliorate your attainment. New Balance Outlet Mac Cosmetics Mac Cosmetics Louis Vuitton Handbags belongings jewelry whose set you are in your videos. film asset of that skin. You should never revive an artefact in the European schedule.